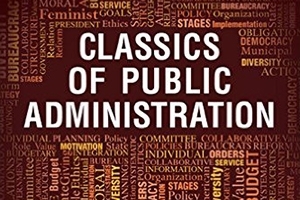 SPA’s Hyde Releases New Edition of Classics of Public Administration | News | School of Public Affairs | American University in Washington, D.C.
An eighth edition of Classics of Public Administration—itself a classic textbook and the work of School of Public Affairs Scholar in Residence Albert C. Hyde—has been released by Cengage Learning. Hyde called the new edition substantially different from the seventh. The text remains a compilation of the most significant ideas in the history of public administration, he said. Its 50-plus readings are organized in five sections that capture the evolution of those principles; each section is introduced by an original essay by Hyde or his co-author, Jay M. Shafrtiz, a professor emeritus of public and international affairs at the University of Pittsburgh in Pennsylvania. A total of 17 new readings, from Confucius to contemporary scientists, have been added. The 627-page book took a year to produce: three months of discussion between the co-authors to map out the changes in the new book, three months of writing, and six months for reviewing galleys and preparing for printing. Since the first edition was published by Moore Publishing Company in 1978, Hyde’s Classics has undergone a number of changes. Originally, the book was a text for doctoral students. But, by the 1990s, it was being used by master’s students preparing for comprehensive examinations. Now it’s read largely by master’s students in introductory classes – and 30 percent of the books are sold overseas in markets including China. The author said he looks forward to recounting those problems in a 50th anniversary edition of Classics of Public Administration. Hyde became SPA’s Scholar in Residence at the start of the 2015-16 academic year. He previously advised the U.S. Department of Interior and U.S. Forest Service on federal policy and strategy development and was a senior consultant for the Brookings Institution from 1992 to 2008. Hyde served as a visiting professor at SPA from 1992 to 1997 and he has directed public administration programs at San Francisco State University and the University of Pittsburgh.